If there is one thing I hear every single day, it’s that people have too many emails and too little time. Yes, we are living in an email world, and I am an email girl. You know? Truth is, when you work-from-home, life revolves around your inbox. Whether you work at home or in an office, chances are email is a big part of it. But we do have options to reduce email before we ever even get it. What I want to share are 3 ways to cut down the volume of emails you get simply by what you say in the emails you send. You may not have control over everything you receive, but your own emails have the power to prolong a conversation or really make it productive. Around here, we are short on time, so productive it is! How many times does an email hit your inbox offering no real information? Whether you are the one originating the email or the one responding, you’re far more likely to make progress if you offer some options. Emailer – I have this issue and I think I need your help. Can you help? You – Sure, what do you need? Emailer – Well, I’d love to set up a call about it. Would that work for you? You – Sure! I can do that. What times work for you? Emailer – I can do any morning this week. How about you? You – I can do Thursday or Friday. Emailer – Ok, how about Thursday then? What time? (bonus email if you are dealing with other time zones) – Sounds great! 10AM your time or mine? You – 10am my time. You – Awesome. What’s your phone number? You – Great! Talk to you then. Guys. GUYS! This is real. This is a real thing that happens all. the. time. That exchange was 14 emails. FOURTEEN EMAILS. I’m bringing out the CAPSLOCK because this has to end. We don’t need to do this. We have the power to change. There are so many times when we have no power. This is not one of them. Use your power! What if instead the conversation looked like this? You – Sure! What do you need? You – That works for me. Thursday is pretty open for me anytime between 9-11AM ET or after 3PM ET and Friday before noon. Want to give me a call at 999-999-9999? Emailer – Sure, I’ll call at 10AM ET on Thursday. Thanks! And just like that, you eliminated 9 emails from ever happening. You never had to delete them. They simply do not exist. Not only that, but you were able to make this appointment work for your schedule! I can’t stress how life-changing this can be. It seems so simple, but I know you know what I am talking about. People don’t do this! Give it a shot and see what happens. Not every email is trying to schedule a meeting. Some things just have to be dealt with. I get that. Maybe you need to provide an update to a client or your boss for an ongoing project. Maybe someone needs your input and it doesn’t require a call. The temptation when you receive an email like this is to let the sender know you saw it by sending a quick reply. In theory, it seems like a considerate move. You might think, I’m not done with this yet but I want them to know I am working on it. Your email might say something like, I’ll have this to you by 5! Or maybe, I’m working on a pressing issue right now, but I can look at this tomorrow. This is really not helpful for a few reasons. And before I sound too preachy, I have to admit that I struggle with this one daily. When you work remotely, you want your employers/clients to know you are really working. I call it over-availability. On the other hand however, is the fact that if someone is waiting on you for something and they get an email from you without it, they are not going to be happy. Unless they are specifically requesting an in-the-moment status update, save the reply until you can provide the results. If you get an email at 1PM and you know you will be done with what they need by 4PM, do the work and reply with your results at 4PM. Everyone gets what they need, you can cross it off your to-do list and there are fewer emails floating around in cyberspace. It’s all good. Common business strategy tells us to anticipate needs before a client even knows what they are. It’s one of the reasons I am a loyal Disney fan and something I try to do on this blog and even as a mom. If you can tap into this skill, it can serve you in just about every aspect of your life. And guess what? 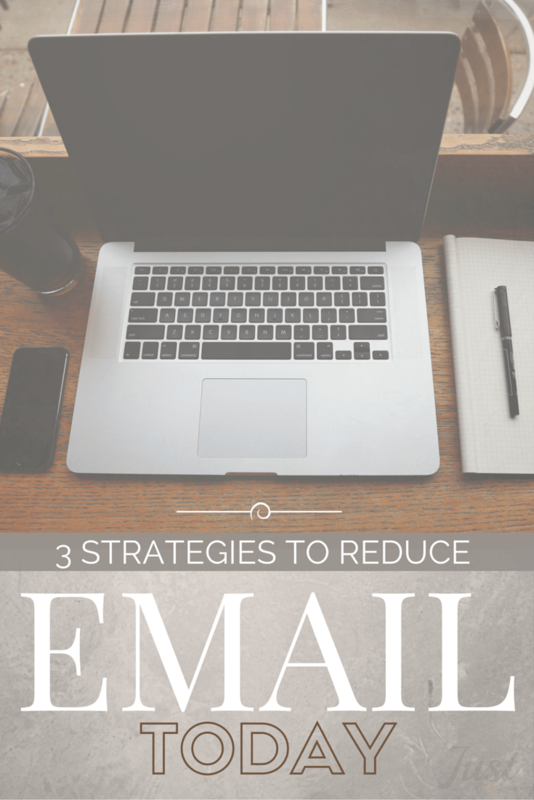 Anticipating the need can actually reduce your email volume! Take the phone call example above. You already know that the emailer wants to schedule a call. So by anticipating the need (call-time, day and phone number to call) you are able to cut down on a lot of email volume. I’ve seen email exchanges go back and forth where one person is asking a question and the responder quickly answers with something like, yes, let me know if you need the file. Now the original emailer may respond with don’t worry about it or maybe they will say great send it over! But, if you have the file and you have access to it, why not respond to the first email with, yes and here’s the file if you need it! You have cut down on email and bonus! made yourself valuable to the original sender by going the extra mile. These are things that I have already tried to do in my own life and I am telling you, it makes a big difference! It’s hard to dig out from under Mount Email so every little bit helps, right? I’d love to know how you cut down on emails. Share your tips below! Great tips, and I like the call to action and responding with information. Otherwise a huge trail of emails will result.